Dry Fruit Laddus are healthy, delicious and guilt free snacks. They are good not only for kids but also for adults.These healthy power packed snack does not have any unhealthy ingredients like sugar or preservatives or artificial food colors. The good thing is that they are so easy to prepare. You can give these laddus to kids after they return from school or even pack them in their snack box. Stock healthy snack like these at home instead of potato chips or cookies and keep them easily accessible to kids. I always feel that it is the duty of parents to teach healthy eating habits to kids when they are young, so that they will maintain a healthy lifestyle when they grow into adults. Today we will learn how to make Dry fruit and nut laddus following our easy recipe. Roast sesame seed on low flame until it splutters. Switch off and leave it to cool.This is for rolling the laddus. Roast all the nuts separately on low or medium flame. Allow it to cool. Then powder it slightly coarse. (dry grind it in a mixie for 2-3 seconds and then smash it using a rolling pin. In the way the laddus are more delicious as you get to bite small bits of nuts while eating the laddus). Heat a tsp of ghee and saute the raisins until they slightly puff up. Buy dates which are soft and a bit sticky. I used Lion Dessert King. Remove the seeds from the dates and grind it coarsely. Keep it aside. Heat 2 tsp of ghee and saute the dates on low heat. Add honey, mix well and saute until the dates become soft (look at the texture of the dates in the picture below). Add the ground nuts, raisins and mix well. Grease your hands with ghee and make small balls when the mixture is warm. 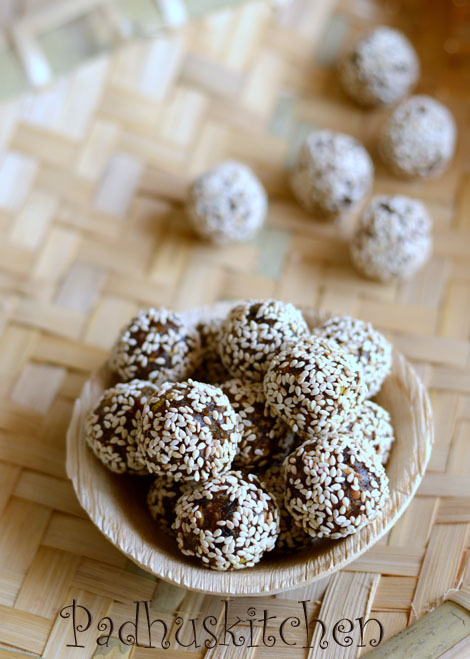 Roll the balls in roasted sesame seeds or dedicated coconut. (I prefer roasted sesame seeds). Storage and Shelf Life - Store these balls in an air tight container and enjoy it. This laddu stays good for more than 10 days at room temperature if handled properly. very healthy and tempting ladoos, Padhu ! Healthy n tasty laddu's. The sesame seed topping on the laddu looks awesome!! Lovely lovely laddoos, very healthy too. Nice combo with honey. these ladoos looks tempting and I am on my way on preparing these for my little ones. BTW, whats the shelf life of these ladoos? do we need to refrigerate these after couple of days? If you prepare it carefully and handle it properly (for eg you should not use wet ladle or kadai or touch the ladoo with your hands) It can be kept at room temperature for a week. For me it lasted only for 5-6 days, so not sure if it will stay good for more than a week. i made this dish for my school culturals & i won the 1st place.& all the teachers loved it. Thanks for the recipie.. its healthy n tempting..! I often prepare dry fruit laddoos.. the only diff I make is that I add khoya. It add little cal to the dessert but its very yummy..! I prepared this. It was very tasty. Definitely kids will like it. It was Sweet without sugar or jaggery. Wonderfull and healthy laddus for kids. Mam one doubt. Can we give this for kids around two years? hi, I'm thivya. nice and very healthy. last weekend I prepared baby corn fingers with slight variations. my kids (5 and 2 yrs) loved it. with in few mins the plate was empty. thank u. my doubt s can I give these balls to my 2 yr kid...r should I make any variations. The child knows better. Try giving a small piece of this laddu. Hi padhu, one more doubt ,can I use kimia dates instead of what you have used.thanks in advance padhu. I have no idea about Kimia dates but you can use any soft dates. Hi Padhu..I am a great fan of your website..Tried the dry fruit laddu today...It was really great and yummy..Love all your receipes and tried many receipes so far...so far all of them turned too good...Keep posting us new recipes...Love you so much padhu..
Hi padhu. What is the measurement for 1/4 cup. 50 grams will do? Yes. If you like more, you can add.